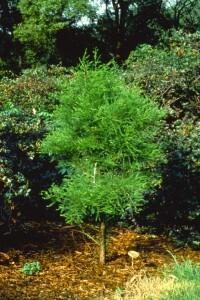 Worldwide there are numerous different plants called cypress. Here are ten different colloquially named cypress (there are more), all being members of the CUPRESSACEAE, the cypress family; Italian cypress (Cupressus sempervirens), Monterey cypress (Cupressus macrocarpa), Arizona cypress (Cupressus arizonica), Siberian cypress (Microbiota decussata), Chinese swamp cypress (Glyptostrobus pensilis), Hinoki falsecypress (Chamaecyparis obtusa), Nootka falsecypress (Xanthocyparis nootkatensis), Leyland cypress ( x Cupressocyparis leylandii), baldcypress (Taxodium distichum), and even Patagonian cypress (Fitzroya cupressoides). But, it is baldcypress which we discuss here. This is a large tree, 50-80-feet tall, with a native range from New Jersey, south to Florida, west to East Texas and southeastern Oklahoma, and also up the Mississippi and Ohio Rivers, to southern Illinois, Indiana, and Ohio. It is completely cold hardy to zone 4. 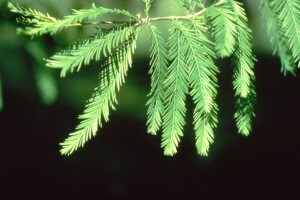 It gets its common name, because it is a deciduous conifer, dropping its needle-leaves before each winter, and reproducing new leaves every year. These numerous, 1/3-3/4-inch-long leaves, occur feather-like, along short branchlets, that themselves often are alternately, or spirally, arranged along the stems. These leaves emerge as chartreuse in spring, later turning to a soft-moss-green, and finally in autumn displaying lovely, orange-brown foliage. These are monoecious trees, with separate male and female strobili (flowers) maturing in one season. Pollen from male catkins released in March/April may fertilize female strobili, resulting in 1-inch diameter cones, resembling tiny, green, soccer balls. These cones mature in late autumn, turning brown and breaking apart into 9 to 15 four-sided scales. Each scale has one, or two triangular seeds. 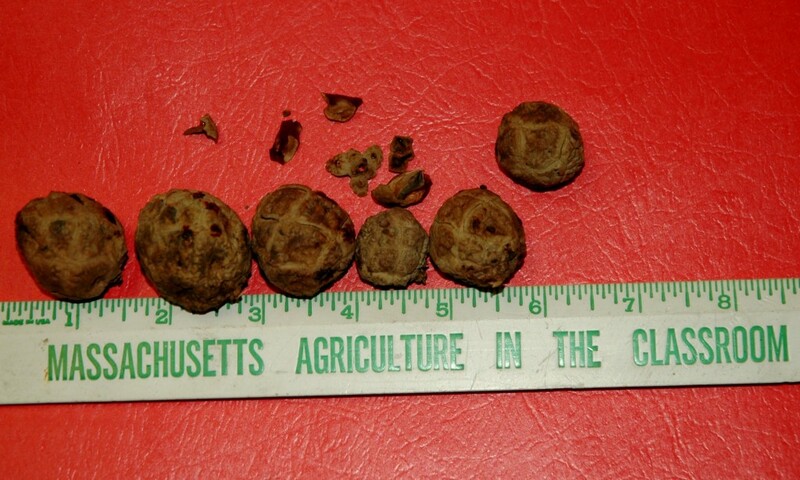 Heavy seed crops do not occur annually, but rather every three to five years. 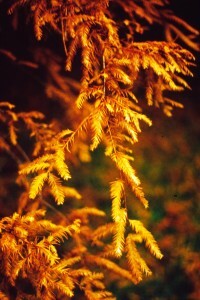 Taxodium distichum in the wild occurs frequently in wet areas. William Cullina in his 2002, Native Trees, Shrubs, and Vines colorfully captures one of its preferred habitat, “Think of bayous; think of tannin-black swamps swimming with alligators and dripping with moss; think of oppressive humidity and torporific heat, and you’ll have pictured the place cypress calls home.” But, perhaps surprisingly, for landscape use, it is also very adaptable to dry and/or well drained soil conditions, as a lawn, park, or street tree. 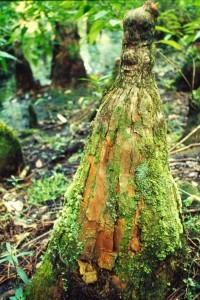 It is in its wet habitat though, where we witness a curious growth known as the famous baldcypress “knees”. 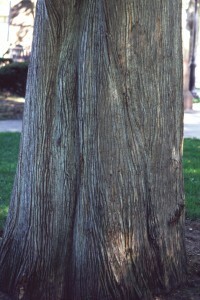 These bark-covered protuberances, from 1 to 3-feet high, appear to be aboveground extensions of the root system. There remains differing hypotheses of their morphology. Previously, many agreed they may aid in increasing aeration to root tissues, or other tree tissues, but science to prove this is lacking. Current thinking leans towards these “knees” providing structural support and stabilization. 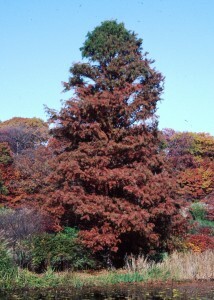 Another notable aspect of baldcypress is their longevity. Research by David Stahle, of the University of Arkansas, has identified a tree over 1,500 years-old, verified as the oldest tree (of any kind) in eastern United States. Along the Black River in eastern North Carolina, is the site of this near-immortal, called Methuselah. Stahle reports that there are hundreds of millennium-old trees at the Black River, and believes a few may be over 2,000 years-old. Previously, there was a baldcypress called “The Senator”, in Longwood, Florida that was estimated to be 3,400-3,600 years-old. Unfortunately, this tree collapsed in 2012, after being set afire. 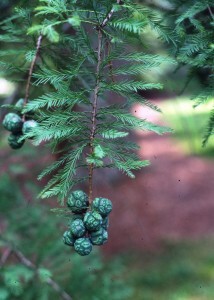 On your next visit to Mount Auburn, look for our comparatively young, baldcypress around the edge of Auburn Lake. “Hundreds of millennium-old trees “!